Sunday is the International Day of Prayer for the Persecuted Church. Millions of Christians worldwide will join together to pray for our brothers and sisters who experience terror because they follow Jesus. South Lansing Christian Church will be joining them. The statistics are shocking really. I could write about the dozens of belligerent nations that persecute believers - nations like North Korea that are not U.S. allies. But what shocks me most are the persecuted Christians who live in countries like Afghanistan where the United States has invested time, money, and the blood of our service members. Earlier this year the Washington Post reported on a Harvard study that projects the war will cost U.S. taxpayers $4-6 trillion by the time we are done paying for it. (The study factors in the cost of a lifetime of care for wounded veterans.) To date 2,274 service members have died there. The cost of this war - in blood and money - is making it less and less popular with every passing day, with two-thirds of Americans saying it is not a war worth fighting. But not for the reason you might think. Our nation has long stood for freedom. And if I thought we could guarantee those freedoms to Afghans my support would be full-throated. But is there anyone who seriously believes that Afghans will permit Christians to practice their faith in an unoccupied Afghanistan when they're murdering Christians while United States Forces are still there? Afghanistan is an Islamic nation under sharia law, where the penalty for conversion to Christianity is death. Pastor Obaid knows of at least 22 missing Christians, who are feared to be imprisoned or executed. He believes there are around 1,000 Christians in the country, who meet in underground churches of between 10-15 members. The fact remains, though, we're not getting out of Afghanistan any time soon. While troop levels are decreasing - an Army Times story indicates a 20% reduction - we're going to be engaged in Afghanistan through at least the end of 2014. What is more, we are currently negotiating for at least some troops to remain in country after that. So what should a thoughtful Christian do? We need to pray for Afghan Muslims. There are moderates in Afghanistan who need Jesus. And there are radicals in Afghanistan who need Jesus. But all Muslims need Jesus. There is no place in the believer's life for a kill-em-all-and-let-God-sort-them-out mentality. Paul wrote, "Christ came into the world to save sinners - of whom I am the worst." Do you suppose there were believers praying for Paul when he was the Sanhedrin appointed persecutor of Christians? I suspect so. We need to pray for our service members. One of our church's elders has a son who will be deployed in 2014. Afghanistan has been mentioned as one of the possible places of his deployment. This soldier is a follower of Jesus. He takes Jesus with him wherever he goes. He is a believer first and a soldier second. Should he be deployed to Afghanistan, he is probably the closest thing to a missionary that our church will ever be able to send to there. I'm praying for his safety; I am praying for his ministry. Finally, we need to pray for Afghan Christians. That's what we'll be doing this Sunday. But perhaps we could pray for persecuted believers every day. The church throughout all Judea, Galilee, and Samaria was at peace. It was being built up and walked in the fear of the Lord, and with the consolation of the holy Spirit it grew in numbers. Three years after he came to power, Emperor Caligula ordered a statue of himself erected in the Temple in Jerusalem. Suddenly the Jewish leaders had bigger problems than this strange Jewish sect of Jesus followers. With their attention diverted to stopping this idolatrous intrusion into their temple, the church experienced a period of calm. In the midst of this calm, the church grew. Luke tells us that the growth was the result of two co-existing realities: the church "walked in the fear of the Lord," and the church experienced, "the consolation of the Holy Spirit." This is my prayer for the church. Not just the church in Afghanistan, but the Church universal. That we would walk in the fear of the Lord. That believers in nations such as ours, where the church is increasing in carnality and looks far too much like the unbelieving world, would begin to walk in the fear of the Lord. And that in nations wherever the church is persecuted believers would experience the consolation of the Holy Spirit. The comfort of the Holy Spirit. This Sunday, on this International Day of Prayer for the Persecuted Church, we have the opportunity to partake in both. That makes sense, I guess. Leyland’s relationship with the media and with fans has been tempestuous the last couple of years. Fans second guess – that is what they do – and the media exists to sell news. So it is no surprise that each constituency has had a love/hate relationship with “Jimmy Smokes.” Of course, those closest to Leyland - his boss and his players love - the guy and that's what probably matters to Leyland the most. Make sure I am spending my time on eternal things. Twenty minutes after the ink on my retirement papers is dry there will be someone thinking about forming a pulpit committee. My kids, though? They’re with me for eternity. Stop acting and thinking like every decision is a make or break moment. Here is the reality of ministry that your pastor lives with every day: the stakes are high. Eternally high. The eternal destinies of people hang in the balance between heaven and hell. Because the stakes are so high, it sometimes feels like every decision is critical to success or failure. What topic should we cover in our next sermon series? What person should we hire for the ___________ position? How should we engage lost people this Christmas/Easter? These are important decisions, but the reality is that an occasional misstep is unlikely to bring the entire train to a grinding halt. 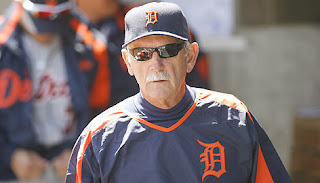 At his press conference today, Jim Leyland said, “When it's time, it's time . . . It's time to step down from the managerial position of the Detroit Tigers. ” I respect that. I hope that I will know when it is time, too. I hope I will do so with the same grace Leyland showed today. And I hope I will do so knowing that I put first things first.